Monday was in the kitchen when she heard Mama screaming for her. When she ran into the bedroom, she saw Mama writhing on the floor, her distended stomach pushing at the material of her dress. Monday nodded, and ran outside, to the old shed that leant against the house. She had to push aside her matted fringe to see properly in the gloom. Finally, she found the old length of rope at the back of the shed, and ran back inside. Without saying anything, Monday tied the rope around Mama’s legs, binding them together painfully tight. In her short life, Monday had learnt that the most important thing was never, ever to let a Day come into this world too early or too late. The hours seemed to blend into one another as Monday worked around Mama’s body, fetching water and placing pillows under her back. Every ten minutes or so, Mama would ask Monday the time, and every time Monday answered, Mama would give a cry of frustration. After several hours, Monday finally heard the voices of Sunday and Wednesday from outside the house, on their way back from hunting in the woods. Wednesday entered before Sunday, and her face changed as she made a quick assessment of the situation; Mama’s panting, heaving form, and Monday’s pale, terrified face. Wednesday took over from Monday; she was older than Monday by a few years, and had helped with Mama’s births many times before. ‘Monday, could you go see to Saturday and Friday? They’ll be scared from all this noise,’ said Wednesday. Monday nodded, and as she left, she heard Mama ask what the time was, and heard her cry of frustration at Wednesday’s response. In the living room, Friday was crouched against the wall, shivering, while Saturday leaned against her, his little face creased with worry. Monday quickly picked up Saturday and sat down with him placed in her lap, and then pulled Friday closer to her. Friday clutched Monday’s hand as another scream came through the walls. The baby came very soon after that. Monday held Mama’s hand, while Sunday and Wednesday pulled the slippery little body out from Mama. They had to untie Mama’s legs, and Monday looked away from where the ropes had rubbed Mama’s skin raw. Monday got to hold the baby, a boy, when he was all slippery and bloody; he had screamed and screamed, gulping in breaths of air furiously. After Mama and the baby had both been cleaned up, and Mama was holding him on the bed, Monday joined Wednesday and Sunday, who were gathering up the soiled linens. ‘Is he okay?’ she whispered to them. Monday didn’t have to ask who Sunday meant. They all knew. All the Days solemnly took turns holding him. The Days quickly adjusted to their new brother. It was just one more mouth in a house with many mouths in it already. Wednesday complained that that there was even less food now for all of them, but that was just Wednesday. Wednesday was the oldest day, and the only Day who could complain about blue skies and sunny weather. Sunday, who was second oldest, was very different. He always cheerful and singing, ready to see the best in everything. It was probably why Wednesday and Sunday got along so well; they balanced each other out. Ms Alexander soon came to the house, to inspect the new baby Day. Ms Alexander had been around for as long as Monday could remember; in fact, for as long as any of the Days could remember. Monday thought Ms Alexander was older than Mama, although it was hard to tell. Ms Alexander’s face was unlined and completely smooth, while Mama’s face was worn and tired. But there was something about Ms Alexander’s face, something in her eyes that made her seem much older. Before she saw Tuesday, Ms Alexander checked the calendar, the most important object in the house. It held pride of place in the living room, on the wall in front of Mama’s chair, and every day, when she got up, Mama would mark the day off. Mama had had the calendar for years, since Wednesday had been born, and there were pages and pages of crossed off months. Whenever Ms Alexander came, she would check that the right day was marked. It always was, but she would check every time. The days on which the Days had been born were marked in vibrant red, and the time of their birth was written in big numbers. Ms Alexander frowned deeply when she saw ’12:04 AM’ written in red on Tuesday’s calendar day. She took a screaming Tuesday from Mama’s arms, and then gathered Mama and the Days together in the living room. She sat in the only chair in the room, a big over-stuffed armchair. Ms Alexander always got the chair. All the Days kneeled on the floor in front of her, and Mama as well, even though she was still sore from giving birth to Tuesday. Ms Alexander questioned all of them for what seemed like hours, in her quiet calm voice. She even looked at Mama’s legs to check for rope burn, lifting up her long skirt to look at the grazes. Mama didn’t say anything, just sat there quietly. After she was satisfied that Tuesday had not been born on a Monday, Ms Alexander seemed pleased, and allowed the Days to stop kneeling. She handed Tuesday back to Mama, who took him with a palpable air of relief. As Ms Alexander said this, Mama drew a quick breath, her face lighting up. But instead of answering, Mama turned, and slapped Monday across the face. ‘How dare you talk while Ms Alexander is speaking! Never. Ever. Ever. Interrupt. Ms Alexander.’ She punctuated each word with another slap. The other Days sat silently, averting their eyes. Any Day who spoke or acted out of turn in front of Ms Alexander felt the sting of Mama’s open hand, or the hardness of her fist. Finally Ms Alexander held up a hand, and Mama stopped. Monday lay on the floor, sobbing quietly, her cheeks bright red from the force of Mama’s slaps. Monday tensed as Ms Alexander leant down to where she lay on the floor, and traced Monday’s cheek softly with one cool finger. Mama nodded her agreement. The path was how Ms Alexander got to the house, and when Ms Alexander wanted Mama to carry another Day, she told her to go down the end of the path. Monday had never walked any distance along the path; they were only allowed to go in the other direction, further into the woods. Ms Alexander left shortly after, having made arrangements for the next month with Mama. She left some new seeds for the garden, as well as some other food, but not quite enough; there was never quite enough, and the white rabbits that supplemented a lot of their meals were often scarce. Monday stayed on the floor in the middle of the room, her stinging cheek pressed against the cool dirt floor, until Mama gathered her up in her arms, and sat down in her chair. Monday was unsure about this. It seemed to her, young as she was, that any house with Ms Alexander in it would probably not be a nice house. She would rather stay in their little three room cottage with Mama and the five other Days, if it meant not having to live with Ms Alexander. But Mama’s hand was warm on her head, and she soon drifted off to sleep, her dreams filled with cold, empty rooms. Tuesday grew quickly, even faster than Saturday had, and definitely faster than Friday, who had been a sickly baby. After a month had passed, Mama started going down to the end of the path each week. When she came back, she always seemed tired, and her eyes looked blank. Sometimes she would teach them all new words or how to count or how to tie a plant to a stake properly. But most of the time she just sat in her chair, staring at the calendar. Not long after Mama had started going to the end of the path, Sunday hurt himself. Sunday was the hunter, and he caught the white rabbits that they all ate. Monday always wondered how he caught anything; he was always so loud around the house, singing and yelling. Wednesday used to go with him sometimes, but there was so much to do at the house now with all the little Days that now it was just Sunday going into the woods alone. He had been walking in the woods by himself when he had slipped on a stone and sprained his ankle, and had had to limp all the way back to the house. Mama decided that, as third oldest Day, Monday would go into the woods until Sunday was better. Monday knew how to hunt rabbits and bring them down with a slingshot, although she wasn’t as good as Sunday or Wednesday, but Mama needed Wednesday to help around the house, and Sunday was useless with a sprained ankle. Wednesday complained bitterly, but Mama had made up her mind. Sunday would look after Friday, Saturday and Tuesday, while Wednesday would cook and look after the garden. And Monday would go into the woods. Before she left, Mama called Monday over, and made her promise that she wouldn’t cross any rivers. There were dangerous things beyond the rivers, horrible men and vicious beasts, said Mama. It was only on this side of the rivers that they were safe. Sunday had told Monday once that if you walked long enough in any direction, there was always a river eventually. Monday had never seen a river, but she promised anyway, looking earnestly up at Mama and repeating the words. Mama always struggled to let one of the Days wander; she liked to keep them all close, because Ms Alexander said wandering too far could be dangerous. Soon after Monday began hunting in the woods, she saw her first river. Monday heard the sound before she saw it, a fierce churning of water. As she emerged from the trees, and walked closer towards the river, she saw that the water was filled with subtle shimmering threads of light, constantly moving in and out of the river’s water. 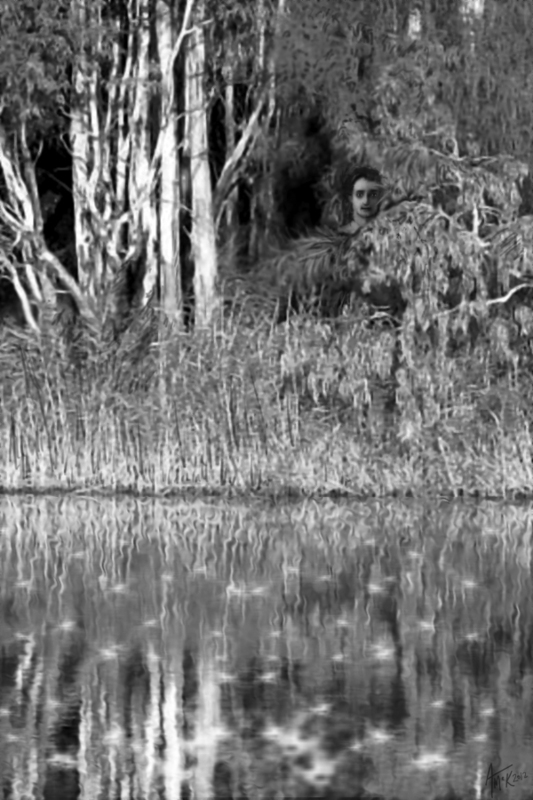 As Monday was looking at the river in wonder, she saw a face, across on the far bank. It had only been for a second, through the trees, but Monday was sure it had been a person. Monday was intrigued. New people came into her world only by birth. She scanned the opposite bank again, hoping for a glimpse of the face. There! There it was! A man (and Monday was sure it was a man, like Sunday would be when he was grown) came out from between the trees. He seemed interested by the river, and the shimmering threads of light within it. As Monday watched he made two quick motions with his hands, painting symbols in the air with shimmering lines of light. The river became calm. It was as if the white-water chaos of only a few moments before had never been, and in its place was a softly babbling stream. Within seconds, the man was confidently striding across the now-shallow water towards her, while Monday stood frozen in shock. It was only when the man was more than halfway across that it occurred to Monday to run, but just as her legs registered her brain’s frantic commands, the man made another quick gesture, and she felt strangely lethargic and calm. She stood there while he finished crossing the river, and walked over towards her. Monday stared up at the man mutely. Who was he? What was he saying? She had understood most of the words but not the way that he had used them, and the presence of the man himself disoriented her. He had dark hair, and was tall, taller than anyone Monday had ever seen. If she had been more familiar with other people, if everything about his face hadn’t been so alien to her, Monday would have perhaps noticed a hint of cruelty around his eyes—subtly hidden but there nonetheless. Monday had never been warned about talking to strangers—Ms Alexander had not even considered the possibility of someone finding their way through the many, many layers of traps and concealments that she had placed around the house. But when the man had stumbled across a patch of forest that had stubbornly refused to let him pass through, he had been intrigued. Above all else, the man was driven by a powerful curiosity; it said a lot about him that he had broken through the barriers merely to see what was on the other side. ‘We… we were all born on the right day. One of the days we needed to be born on. Except for…’ She hesitated. ‘There was a baby born between Friday and Saturday, but it was wrong. It came too soon, and it was a Wednesday, and we already had a Wednesday. So Mama and Ms Alexander took it away, to the back of the house.’ Mama had cried for weeks after that. The man considered this in silence. If the death of a tiny superfluous Wednesday bothered him, he didn’t show it. Monday looked at the small screen, squinting. There was a small picture of Ms Alexander there, staring out fiercely. She jumped back. He looked down at Monday, assessing her. While his gaze wasn’t overtly unkind, neither was it truly friendly; it was more that of a butterfly collector who has seen a particularly rare specimen in the wild. ‘I don’t… I don’t know.’ Monday thought that her siblings might be some of those things, but the way the man was staring at her was unnerving her. ‘Saturday and Tuesday are only babies. I don’t think we’re special…’ Monday trailed off as the man grabbed her chin, turning her head this way and that. ‘Well, no matter. There is no doubt that you are a fine specimen of a Monday-child. Fair of face, and the power shines right through you.’ He let go of her chin, and absentmindedly brushed off his hand on his pants. Monday would have asked what he meant by fair of face, except while his hands were near, she had smelled him. He smelled like rabbits three days after she had killed them; like old blood. And Monday felt her heart disappear and asked no questions. And with that, he was gone, striding back across the stream, just like he had arrived. As he reached the far bank, he made the same two motions again, except in reverse, and the river became a raging torrent once more. 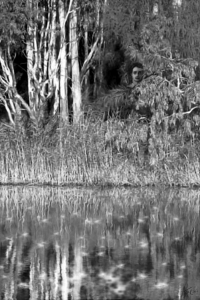 Monday stared across the river until he was hidden by the trees. At least she hadn’t broken her promise to Mama, Monday thought. She hadn’t crossed the river. Someone else had crossed it for her. Mama beat Monday when she came home with no supper. But despite what Mama said, and what the man may have thought of Monday in his brief encounter with her, Monday’s unorthodox and limited education had not resulted in her being stupid. She apologised, and told Mama the white rabbits had been particularly shy that day; then, curled up in the bed with Mama and the rest of her siblings, she stared thoughtfully into the darkness. Monday decided to keep her encounter with the strange man to herself. That way, Ms Alexander would never find out about it, and the confusing words that the man had said about sets and collections and power. Monday slept, and the empty rooms of her dream were all filled with rivers, rivers with threads of shimmering light through them. As the months passed, Mama went down the path every week, until one day, she pressed her hand against her stomach and beamed. Mama’s stomach swelled, and Ms Alexander visited and seemed pleased. She patted Mama’s stomach gently, and Monday wanted to rip her cold hands away. But Mama seemed to like it, and looked proud when Ms Alexander placed her hands on Mama’s stomach and pronounced the baby healthy. Monday had almost completely pushed the man out of her mind. Until one day, as Ms Alexander was leaving, she had grabbed Monday’s chin in her hands painfully tight, examining her face intently. She said it in her usual carefully controlled tones, but Monday caught a hint of something else behind it. Monday lowered her head, and thanked Ms Alexander, but inside she felt a deep flush of fear. The man by the stream had said the same thing. Did Ms Alexander know? But if Ms Alexander noticed the quick flash of panic in Monday’s eyes, she attributed it to the same carefully cultivated fear that all the Days felt towards her, and thought nothing more of it. But the man had not forgotten Monday. Even though Sunday’s ankle had healed, Monday had become the main hunter for the family. She was quiet and skilful, and brought back more rabbits than Sunday ever had. One day, she was out hunting, far away from the rivers, when the man appeared, stepping out casually from between the trees as if he had been there all along. Monday put down the rabbit she had been skinning and settled back onto her haunches carefully. She had tried to run last time, and somehow, the man had stopped her. So, she decided that there would be little point in trying to run again. Also, she didn’t want to lose her catch. ‘Ahh, so the birth can’t be that far away.’ The man sniffed the air, and then looked down at Monday. ‘Ms Alexander will be upgrading the wards, so I won’t visit again before it’s time. See you soon enough, little Monday-child, for the grand finale.’ And with that, he was gone, slipping back through the trees. It seemed to Monday that the month before the birth went far too slowly. She went over the man’s words again and again in her mind, trying to decode their meaning, but it remained beyond her grasp. Two weeks later, Ms Alexander visited the house, prodding Mama’s full stomach and asking questions. Ms Alexander eventually decided to return late next Wednesday. As Thursday was the last Day, Ms Alexander didn’t want to take any chances, and would be bringing special equipment to help with the birth, to make sure Thursday wasn’t born wrong. Mama looked scared as Ms Alexander said this, and Monday felt the fear in her stomach grow until it seemed to be the only thing inside of her; a twin to Mama’s baby, kicking and screaming deep within her. The day before the birth, a Wednesday, Monday could feel it; feel the pressure in the air that the man had talked about. Her skin seemed hot yet clammy, and the other Days seemed to feel it as well. They all drifted around the house lethargically, squabbling over nothing. Ms Alexander arrived late, long after the sun had gone down. She stayed outside the house for a while, painting symbols on each of the walls, and it seemed to Monday that the feeling of pressure increased once Ms Alexander came inside. She had brought sweet treats for the Days. They had only rarely had sweet things, and they all devoured the morsels quickly, except for Monday. The fear in her stomach made eating almost impossible, and she only ate a little bit, slipping the rest to Sunday, who always seemed to be growing. After dinner, Wednesday, Sunday and Monday played with the little Days, while Ms Alexander tied Mama up on the bed. Saturday’s birth had been like this, had been forced before Mama’s body had wanted to push the baby out, because Ms Alexander had been sure that he would be born on the wrong day if she didn’t intervene. The Days had been kept in the living room, but Mama hadn’t even screamed at all. When Ms Alexander had called the Days in afterwards, Mama had been awake with Saturday cradled in her arms, and Mama’s stomach had a neat crescent shaped red scar on it. Mama had explained to them all later that Ms Alexander preferred not to interfere in the births of the Days unless she had to; Mama’s body was wide-hipped and made for giving birth, and Ms Alexander preferred to let things take their natural course. Monday had thought Mama looked proud as she said this; proud of her wide hips, that Ms Alexander so valued. But this birth felt different to Saturday’s birth. Ms Alexander had put Mama into a deep sleep straight away, pressing a needle into her arm. She had then drawn neat symbols all around the room, and the bed. Monday thought that they looked similar to the symbols that the man had drawn in the air the first time she had seen him, but spikier, with more jagged edges. As the Days played with each other on the floor around Mama’s bed, waiting for Thursday to come, they all slowly grew more and more lethargic, until they were all asleep in a pile on top of one another. All of them except for Monday, who had only eaten a bit of the treat that Ms Alexander had given them. Monday sat against the wall in the corner by herself, drowsy but not asleep; it was through hazy eyes that she saw Ms Alexander check her watch one final time. When the minute hand crossed the twelve, Ms Alexander produced a plain knife from her bag, and wordlessly, began to cut into Mama’s stomach, at the line of the old birth scar. Eventually, after she had made the hole wide enough, Ms Alexander pulled Thursday from Mama, a little girl, her skin bloody. Thursday took her first breath, and began to scream, the reedy wail of a newborn, but it was the only sound in the room. Mama remained silent, her motionless form splayed on the bed and none of the other Days stirred. Monday watched as blood from Mama’s stomach slowly welled up on the bedsheets, and wondered why Ms Alexander wasn’t doing something to stop the terrible bleeding. Slumped upright against the wall on the other side of the room, Monday tried to move, tried to get up and save Mama, but it was too hard to think with the unrelenting pressure, too hard to move limbs that felt as if they were filled with rocks. Ms Alexander gently placed Thursday on the floor, next to the pile of sleeping Days—and then, without hesitating, straightened up and gently slid her blade into Mama’s chest, up under her ribs. It was only as blood slowly began to well up from between Mama’s lips that Monday truly understood that Ms Alexander had never meant to stitch Mama back up. Before Monday’s horrified eyes, Ms Alexander crouched down next to the sleeping Days, and, as if crossing off a checklist, she found Sunday’s sleeping body. ‘Sunday,’ she murmured as she drew the knife across his throat, and the symbols around the room glowed slightly in response. Monday would have screamed, would have wailed and kicked and spat, but she still couldn’t move, couldn’t speak at all. ‘Saturday, Friday, Thursday, Wednesday, Tuesday.’ None of the other Days ever woke from their slumber, as Ms Alexander found each of them on the floor, and drew her knife across their small necks. As each of her siblings died, Monday felt a jolt, a physical beat that grew within her, until her entire body felt as if it was pulsing in time with the symbols themselves. Eventually Ms Alexander straightened up from the pile of bodies, her face covered in a thick mask of blood. She calmly looked around the room for the last item on her checklist. Her gaze fell upon Monday, and her eyes widened in shock and panic as she realised that Monday was awake. In two quick strides, Ms Alexander strode over to where Monday sat unmoving against the wall. Without taking her eyes off Monday’s face, Ms Alexander slowly reached out her hand to grip Monday’s chin for the final cut across her throat. When Ms Alexander’s hand, covered in the blood of the rest of the Days, touched Monday’s face, Monday felt the power taken from all of her siblings coalesce inside her; heard each of the Days’ voices whispering inside her head. She felt the house itself pulse around her, trying to contain the power that had been released within it. The symbols on the walls flared impossibly bright, and then, one by one, faded until their light was completely extinguished. As the symbols’ light faded, Monday found herself able to move again. Without knowing why, Monday raised her hand and drew a single, perfect line of shimmering light in the air in front of Ms Alexander’s throat. It was a line that seemed infinitely right somehow, and Monday felt her entire being focus on that line, felt seven different powers interlock within her as she willed it to exist. The last thing she heard was a thud as Ms Alexander hit the floor. The man surveyed the quiet house. He had been watching for hours, from the cover that the woods provided. He had seen Ms Alexander arrive at the house, and had noted well the wards of protection, binding and transference that she had painted on the exterior walls. He had heard the humming and pulsing of released power as she began the execution of the Days. And unexpectedly, he had seen the light of the exterior wards fade, as their bonds had been broken. After a short wait, to allow some of the released power to dissipate, the man entered the house and made his way carefully through the small rooms. He made certain to avoid touching the walls, which were still humming slightly with remembered power. As he entered the bedroom, he paused. The small bodies of the Days lying on the floor didn’t seem to trouble him, and there was a hint of Ms Alexander’s cool dispassion in his eyes as he noted the deep cuts on their necks, and their splayed limbs. He looked intently at the burnt-out wards, their lines fuzzy and charcoal black. But the man’s composure was broken by a slight frown as he considered the frozen tableau of Ms Alexander and Monday. Monday’s body lay still and unmoving, half-slumped against the wall. In front of her, Ms Alexander lay with her knife still gripped in one hand. Her throat had been almost completely cut through, and her head was only connected to her neck by a strip of skin. The wound at her throat was quite different to those of the Days. It had been cauterised in a perfectly straight line, and there was no blood. The man looked down at Monday’s small body. He was surprised to observe that her chest still rose and fell with the barest suggestion of breath, in the deep rhythms of sleep. He made several protective wards in the air before reaching down and placing his hands around Monday’s throat; her pulse was thready and uncertain under his hands. He stayed like this for several seconds, before coming to some internal decision. He moved his hands down until they rested under Monday’s armpits, and then lifted her up and slung her over his shoulder. As the man left the house and headed into the woods, he adjusted Monday’s unconscious form more securely onto his back. And the man, who once, long ago, had been called November, carried her away. And Monday never went back there, to the house in the woods.